I'm going to cut right to the chase with this one. People LOVE this potato salad. Every time I make it, I get tons of compliments and requests for the recipe. Yet another one that I thought I should get around to sharing. 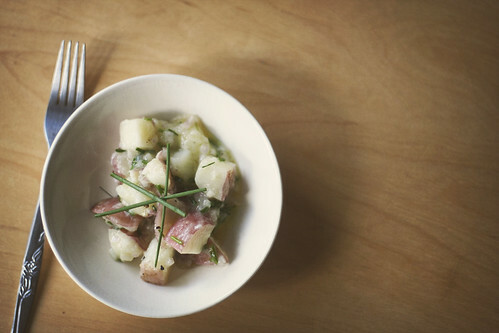 This potato salad is awesome on so many levels. The best "feature" is probably the lack of mayonnaise. No mayo means you don't have to worry about it keeping cool, and it makes all your anti-mayo friends happy. The other thing I like is that the ingredient list isn't that long or complicated and well, it tastes damn good. It's perfect for all those BBQs and picnics you're going to be invited to this summer, am I right? Meanwhile, whisk together ½ cup of the oil, 2 tablespoons of the vinegar, the wine, and 1 tsp of salt in a bowl large enough to fit the potatoes (and toss them without making a mess). Remove the potatoes from the pot and combine with the oil and vinegar mixture; toss gently. Set aside to allow the potatoes to absorb the dressing, about 20 to 30 minutes. Meanwhile, in a small bowl, make the final dressing. Whisk together the remaining 2 tablespoons olive oil, the remaining 1 tablespoon vinegar, the parsley, shallots, and chives to taste in a small bowl until thoroughly blended. After the potatoes have had time to absorb the oil and vinegar mixture, add the herbed dressing mixture to the potatoes and toss gently. Season to taste and serve. This recipe says it serves four. I usually double it and sometimes even triple it. It's best to serve this in a bowl that is not clear glass. This salad is on the oily side, and the oil tends to settle and I think it sometimes can be off-putting when people see the oil in the bowl. It usually just needs a bit of a toss before serving and it looks fine. Speaking of the oil, you could probably cut back on it by about 1/4 of a cup (for the dressing that the potatoes marinate in), and I think it would still be fine. The last time I made this, I didn't have parsley so I added a bunch more chives and I think it turned out just fine. \n\n\nI'm going to cut right to the chase with this one. People LOVE this potato salad. Every time I make it, I get tons of compliments and requests for the recipe. Yet another one that I thought I should get around to sharing. \n\nThis potato salad is awesome on so many levels. The best \"feature\" is probably the lack of mayonnaise. No mayo means you don't have to worry about it keeping cool, and it makes all your anti-mayo friends happy. The other thing I like is that the ingredient list isn't that long or complicated and well, it tastes damn good.\n\nIt's perfect for all those BBQs and picnics you're going to be invited to this summer, am I right?